In the early 1900s, Eastern bluebird populations in North America were dwindling. Several factors contributed to their decline: ice storms in their wintering grounds, a loss of nesting habitat, and poor nesting success due to competition with introduced species such as European starlings, house sparrows, and other aggressive cavity-nesting birds. 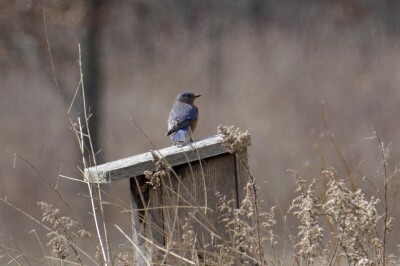 The Wisconsin Department of Natural Resources Bureau of Endangered Resources (now Natural Heritage Conservation) put out a call in 1986 to conservation-minded citizen groups to help save the Eastern bluebird. 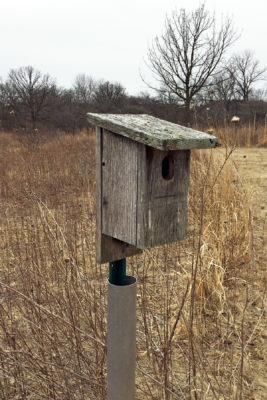 As a result, the Bluebird Restoration Association of Wisconsin (BRAW) was formed to spearhead an artificial nest box program. The model for the program was a “bluebird trail”—a series of nest boxes at specific locations monitored by an individual or group. In 1988, Sylvia Marek, with the support of the Arboretum administration, took up the challenge to do her part to help the imperiled species: she designed and installed a bluebird trail in Longenecker Horticultural Gardens. For 30 years, Sylvia has consistently and meticulously attended to each box and actively managed the trail. Sometimes she made major changes, such as reducing the number of boxes or swapping one design, while at other times she only made slight adjustments to an individual box location or rotated it slightly to orient the opening in a different direction. The goals were always the same: encourage use by bluebirds and deter predators. Each year, she makes weekly checks of all 15 boxes during the nesting season (April through July) and records if eggs were laid, how many, and if they hatched, fledged, or were predated. After 30 years, the wooden boxes showed significant wear and many were literally falling apart. Arboretum staff placed an order with BRAW for 15 new boxes. 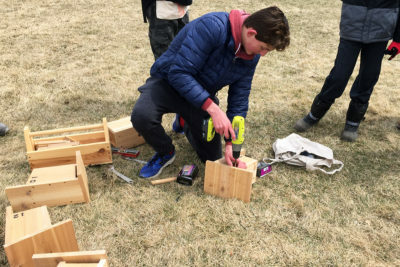 Soon after, Pat Ready, the President of BRAW, told us that a high school student had contacted him about constructing bluebird boxes to help fulfill Eagle Scout requirements. Perfect timing! The student, Owen Brown, was excited to not only help conserve bluebirds, but to do so at the Arboretum. He raised all the funds to purchase materials and then led his troop in constructing 15 attractive, well-built boxes. He and his fellow scouts removed the old boxes and worked alongside Sylvia to install the new ones to her exact specifications. By all accounts, the bluebird trail model in Wisconsin has been a great success, as it has not only restored an imperiled species to a stable level but also engaged citizens like Sylvia and Owen. For Sylvia, the fruits of success are in the numbers: from 1988 to 2017, 694 bluebirds have fledged from the Arboretum boxes. Her bluebird trail is likely one of the longest running in the state, and thanks to Owen’s generosity and hard work, it will likely continue for many years to come.